Ten years ago, a young renegade ski racer (Shane McConkey) quit his collegiate team to pursue a career in the small, unglamorous world of freeskiing. 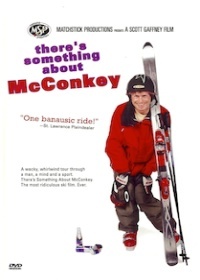 Through the 90s, McConkey battled the odds and the establishment as he put “fun” back in skiing. With an unprecedented manner of attacking mountains and a committed effort to appear ridiculous, McConkey opened the doors to a new way of thinking. And as attention to his feats and antics blossomed, so did the sport around him. We’ve teamed up with the raddest skiers of today with the past decade’s most influential skier and biggest idiot. a mind and a sport. You may never look at skiing the same way again.